Summary: Between $800B and $2T is laundered each year. Next-generation BSA/AML solutions with artificial intelligence could help. After measuring the sun's magnetic energy, a group of scientists now project that within the next 30Ys, the world could see a mini ice age. Temperatures could start falling in only 4Ys and the solar cycle will continue until 2050 when things begin to warm up again. So, grab your blankets and get geared up, because if these scientists are right it could get mighty icy out there in some areas of the country and world. 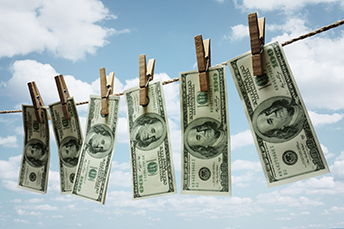 When it comes to banking and ice cold cash, money laundering remains a big business. According to the United Nations Office on Drugs and Crime, between $800B and $2T is laundered each year. The world spends more than $8B annually on AML work. In the US, regulatory agencies constantly look to capture and report on bad actor activities, but it comes at a cost. As such, navigating increasingly complicated rules is pushing banks to look for more effective and cost-efficient compliance solutions. The majority of current fraud-detection methods are based on history. Data mining, neural networks and business rules all rely on learning from the patterns of former frauds. After all, a large amount of data about past frauds is available, so it makes sense. Unfortunately, little of this data is specifically labeled as money laundering, because it is generally a very complex business that is extremely hard to detect. Money-laundering methods are constantly evolving, from loan-back schemes to front companies, black-market currency exchanges, and funneling money through shell companies using multiple banks and jurisdictions. Most current methods miss this, applying the same techniques designed to detect fraud, or simple money laundering patterns. Low detection rates of actual money laundering, plus high false positive rates, are the result. These poor results can be expensive for banks. Current methods require the additional costs of hardware and databases. False-positive rates also increase compliance costs, because substantial human work hours go into investigating such a large and ongoing number of alerts. Banks are hopeful that the next-generation solution for BSA/AML can be found in artificial intelligence (AI). Here, tools can gain insight from data without any reference to history. AI uses techniques such as temporal clustering, link analysis, associative learning and other techniques to learn in a forward-facing way. This increases costs for bad actors and gives banks more protections. It also lets banks and regulators better track transaction volatility, entity interactions and behavioral changes. The best machine learning solutions can incorporate multiple data points from multiple sources, which is a crucial part of tracking money launderer activities. Eventually, the banking industry could even create a centralized cognitive computing tool that incorporates multiple information sources. Such a tool may yield a more powerful data set, creating higher data quality and stronger analysis perhaps. At this point many bankers feel anything might be an improvement, so the industry is actively exploring AI and other methods. After all, research by LexisNexis finds 55% of banks surveyed say AML compliance has a negative impact on their business productivity. You don't have to have artificial intelligence to know that such a huge and ongoing cost continually blows an arctic chill on the entire banking industry. A Bank Director survey of directors and executives indicates community banks may want to consider reducing the number of meetings per year to match what larger and more complex banks are doing (as well as enhance performance/reduce costs). Banks >$5B in assets meet 9x per year for the holding company board and 8x for the bank board. Meanwhile, committees meet during the year as follows: loan (10x), audit (9x), compensation (6x), risk (6x), executive (5x), governance/nominating (5x), and technology (4x). Financial analytics firm Ovum ICT Enterprise Insights produced data that shows 50% of US commercial banks expect to increase their IT spending for real time payments (RTP) systems in 2018. Of that group, 28% will increase their budgets over 6% from 2017. IBM reports the financial services sector experiences more cyberattacks than any other industry. A Census Bureau survey finds 18% of apartment renters say they were unable to pay the full rent due in at least one of the past 3 months vs. 7% in 2015. The long lost millennial in the housing sector appears to have finally shown up. The latest data shows homeownership has climbed to 63.9% in Q3, its highest level since 2014.